The ground floor of this brick building, located at the corner of Monroe Ave. and Ionia St. NW, is occupied by the grocers Rice & Moore. Bushel baskets of produce are stacked on the boardwalk on both sides of the front door where three men are standing. Two others stand to the right of the door on the boardwalk and another, in shirtsleeves, stands to the left of the building. A double gas lamp can be seen through the left front window. At the far right a stairway leads to the upper two floors, and a small sign indicates Police Headquarters can be found there. Probably the light outside the second-floor window at the far right indicates the Police offices. Windows on the seconds and third floors are open indicating warm weather. Three large horizontal signs are painted on the left side of the building. A closed awning can be seen over the entrance. The drop from the boardwalk to the street shows its foundation, and there is a ramp leading up from street level at the lower left corner. Title by cataloger. 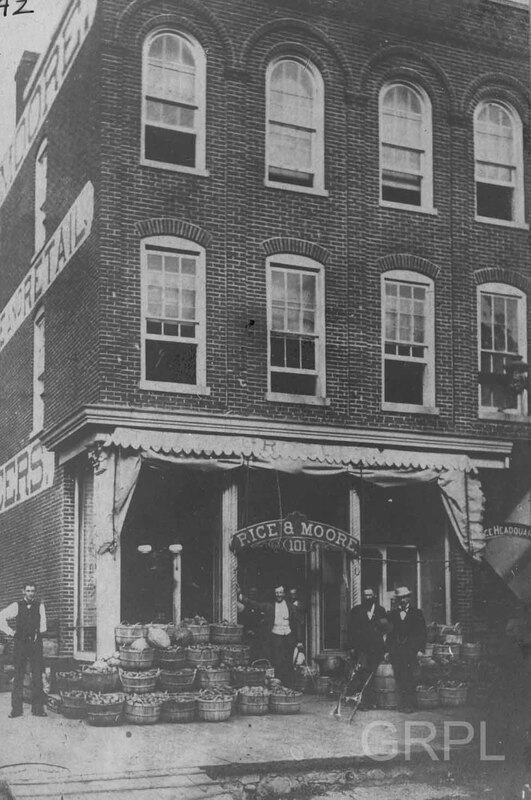 From 1871-1882 The police department had two rooms at Monroe and Ionia; one for an office and another for a lock-up. In June of 1882 they moved to larger facilities at the southeast corner of Lyon and Campau. New headquarters were built in 1892 on Crescent at Ottawa NW.